Carpe diem! 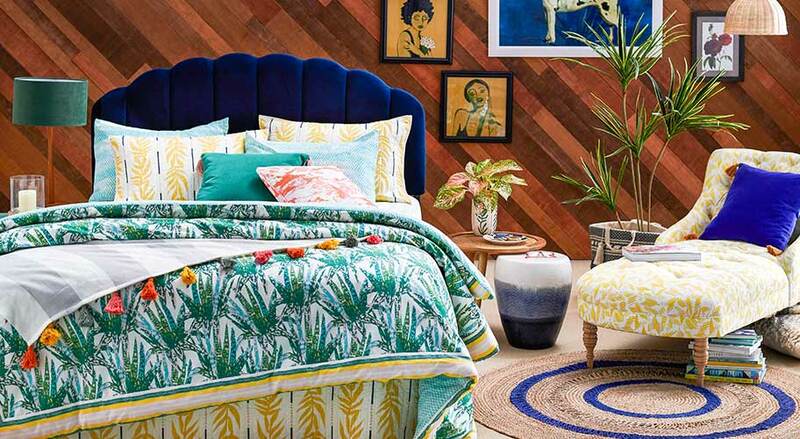 Wake up refreshed & ready to seize the day with bedroom designs from Drew Barrymore Flower Home. Beautiful details & luxurious materials promise a refreshing start to your mornings & relaxation at night. Bedrooms should be comfortable sanctuaries that welcome their occupants and create a tranquil atmosphere for sleep or relaxation. The product categories listed on this page cover all the essential bases necessary for you to curate your ultimate bedroom. 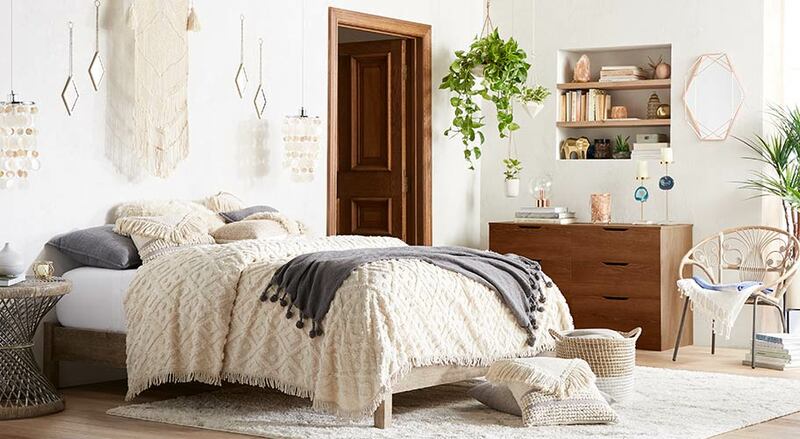 From organizing your clothes and other possessions to achieving just the right kind of coziness under the covers, the products in this section support your bedroom design goals and make your life a little better with Every Day Low Prices. It’s hard to get a good night’s sleep when you’re cold or uncomfortable. Avoid that problem with smart shopping in these bedding subcategories. Keep in mind that each subcategory in our Bedding section requires consideration in order to make a successful purchase. In addition to knowing the size of the mattress you’re working with, it pays to understand your personal preference for material types and textures. Sheets: Sheet sets tend to consist of flat and fitted sheets with one or two pillowcases, though some product options in this category may include each piece sold separately. Read product descriptions carefully and double check your mattress size before purchasing sheets. Other factors, including pocket depth and care instructions, are also worth considering before making your final decision. Bedding basics: This is the ideal category for anyone starting their bedroom from scratch. Whether you’re upgrading from your old-school bedding or creating a new arrangement for the guest room, this section has everything you need to build a collection of bedlinens from the ground up. Dust ruffles, mattress protectors, mattress pads, basic comforters and other bedding essentials are all available in a variety of materials, styles and sizes. Pillows: Pillow fill types and ideal firmness are two of the biggest concerns to address while shopping in this category. Ideal pillow firmness tends to correlate with your sleep position. Those who sleep on their stomachs tend to need the least head support and therefore usually do best with soft pillows, while back sleepers often prefer medium or medium-firm filling levels and side sleepers find that firm pillows give them the best head and neck support. Switching to a new pillow firmness could be the solution to persistent neck pain problems. Both down/feather and synthetic pillow fill can be suitable in different firmnesses, though synthetic fill is preferable if you're allergic to down. Blankets: Blankets are the ideal layering component in a bedding collection. Often, homeowners opt to keep a collection of extra blankets just in case they’re needed between seasons or when guests arrive and want a little more nighttime warmth than the host is accustomed to. Blankets sized to fit standard mattresses are often too large for use as throws on a couch or chair, so keep that in mind when shopping for your lounge area blankets. Bedroom furniture shopping needs are typically less focused on material and physical feel and more focused on size and style. The bedroom furniture you choose can dominate the decor of the room, so consider different colors and styles carefully before deciding on a winner. Beds and headboards: In this category, beds tend to include both a headboard and a frame, while headboards are standalone pieces that can match with a standalone frame. Some headboardless bed frames may be available in the beds category. Nightstands and dressers: Tidy clothing storage and bedside organizing are best achieved with the right dressers and night stands. Dressers come in a variety of different sizes and orientations, with both long and tall options available in this section. Personal preference and room size should help you decide which dresser is best. Similarly, the height of your nightstand should allow for easy access from your bed. A too-tall nightstand paired with a short bed frame throws off the proportion of the room and makes it difficult to reach items on the top of the table, including lamps. Mattresses: Firmness and size are the two major things to think about when you're mattress shopping. In terms of size, the standard mattress measurements of twin, twin XL, full, queen, king and California king (or Cal king) aren’t the only criteria to consider. Mattress depth, or the thickness of the mattress, is also an important consideration because it impacts how high up you’ll be while in bed. This can also have an impact on what kinds of fitted sheets are most likely to fit on your bed. Thicker mattresses call for deep pocket sheets in most instances. Decor is the finishing touch that makes your bedroom personal and captures just the right atmosphere. Choose decorative pieces that match with your bedding choices and furniture style to achieve a cohesive look in your bedroom.